VW continues to roll out new and redesigned SUV models and the brand is also in the “electric offensive”. However, the largest car maker announced recently a joint venture with the Blue Oval Brand and as the result of the partnership the next generation VW Amarok will be based on the Ford Ranger. The new mid-sized pickup truck should appear by 2022 but there are no signs that VW will bring the Amarok on the American soil. Some reports claim, however, that VW-badged truck could actually appear in the US but based on the Atlas SUV. This isn’t a new story. VW presented the Atlas Tanoak Concept at the 2018 New York Auto Show but said that there isn’t plan for the production despite the model was revealed in near-production form. The Tanoak Concept shares plenty of the equipment with the Atlas SUV and just some styling elements and interior design are concept-like. VW hasn’t also rejected a possible launch of the truck and admitted it is weighing the potential of such model. 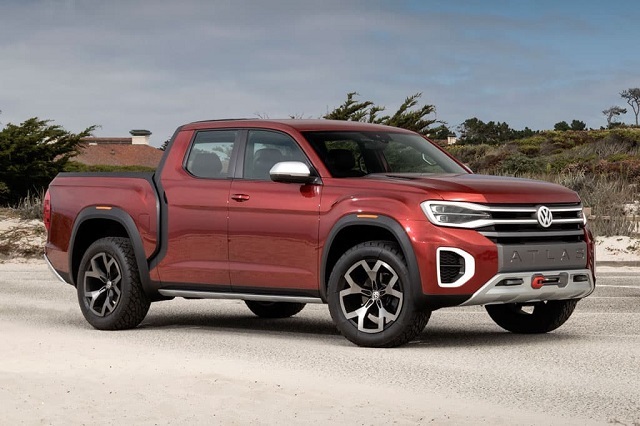 The recent rumors suggest that model could join the market as the 2020 VW Tanoak Pickup Truck but VW hasn’t confirmed that. VW had another presentation of the truck concept and the Tarok compact truck was revealed at the 2018 Sao Paolo Show shortly after Tanoak was shown. The destiny of this model is clearer as VW already confirmed the production version for the Brazilian market. If the 2020 VW Tanoak Pickup Truck really reaches the US market, and we don’t have solid proof yet, it would be another uni-body design alongside the Honda Ridgeline and anticipated Hyundai Santa Cruz. The model would use brand’s flexible modular platform which forms the base of the Atlas SUV as well and would provide a car-like driver quality. The reports also indicate that the model should stay around the dimensions of the Concept model which puts it in the mid-size class. The model should measure around 214 inches in length which makes it 3 inches longer than the recently reintroduced Ford Ranger. It would have around 11 inches longer wheelbase than the three-row Atlas SUV to open the space for the cargo bed. The model is expected to come in the crew-cab form only and with a short bed. The Concept cargo bed measures 64.1x 57.1 inches. Styling wise, the production version should get a more commercial appearance. That means lack of extensive use of lighting units from the Concept version and the grille and headlights design closer to what we can see on brand’s newest SUVs including the mid-size Atlas. The taillights would also have more conventional design without the full-led style. As for the interior of the model, it should provide an SUV-like feel and comfort. There shouldn’t be much difference compared to the interior design of the Atlas SUV. The model would have a horizontally-oriented dash and integrate the new infotainment system with Apple car Play and Android Auto. The base version would likely use a smaller center display like the entry-level Atlas SUV and add larger 8-inc unit in the upper grades. There should also be a Digital Cockpit design with the digital instrument cluster. The model would also offer navigation, Wi-Fi hot spot, Fender Sound System, automatic climate control, premium upholstery, etc. The safety of the truck would also be on the high-level thanks to the inclusion of the advanced safety systems. There should be some active safety systems from the base version. The list would include automatic emergency braking, adaptive cruise control, lane keep assist, blind spot monitor, rear cross-traffic alert, and surround view cameras. There should be no surprises about the engine options of the 2020 VW Tanoak Pickup Truck if it arrives. Like the Concept version, the model would use a 3.6-liter V-6 engine sourced from the Atlas SUV producing 276 hp and torque of 266 pound-feet. The engine should be in the mix with the 8-speed automatic transmission. A 2.0-liter turbocharged four-cylinder engine is also the possibility for the Tanoak Truck if it sees the production lines. This engine would also be in pair with the 8-speed automatic gearbox and VW would offer four-wheel drive as well. If the model gets the production form, it should be able to tow in 7,000 pounds range. 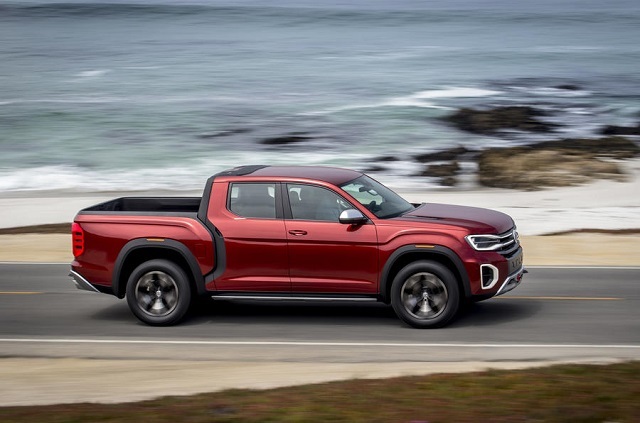 VW hasn’t confirmed the arrival of the 2020 VW Tanoak Pickup Truck and there is no official statement about its launch in coming year either. The rumors claim it could debut by the end of the year and be marketed with the price around $30, 000.